Whilst my previous blog posts have focused on how to “manage” your children’s undesirable behaviour, this post looks at some simple tips for how you can encourage good behaviour. Have you heard the saying, “we tend to live up to what people expect of us”? This is also known as a self-fulfilling prophecy. Children tend to believe what adults tell them, so if the key adults in their lives tell them they are smart, kind, funny, brave, or rude, naughty or, lazy, they will probably believe it… And their behaviour will likely match up to those expectations. The early years are powerfully influential in a child’s formation. It is at this age that children are most likely to believe they are what you say they are or, in other words, “internalise” your perception of them. So give them something positive to live up to. 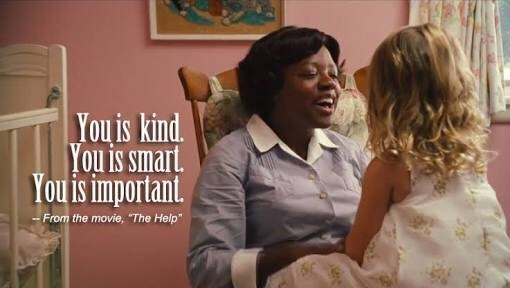 I love this beautiful quote from “The Help”: Aibileen reminding Mae Mobley of her self-worth and inspiring the development of character traits which will stand her in good stead throughout her life. So expect the best of your kids and let them know what you expect of them. Your influence is at its strongest when they are young, before influences outside the home such as peers and other adults begin to usurp the role of mum and dad as hero-who-can-do-no-wrong. Make the most of it. Let your children know exactly what you like about their behaviour (and why you like it) so they know how to do it again! For example, “I love how you’re sharing your toys with your brother. You are such a kind person”. To be most effective, praise should be both specific (name what was great in that situation) and immediate (it’s much easier to connect the dots between “something I did”/”something I am” and Mum or Dad’s enthusiastic response if there’s only a little gap between the two factors). Some recent research has indicated that how we praise children is influential in how they make sense of the situation. While praising behaviour lets kids know they have done something well or right, and will likely lead them to repeat the behaviour, praising their character teaches them to internalise those positive traits as part of their personal identity. This means their motivation to behave the same way again will be both stronger, longer lasting and have higher internal motivation . Simply put, telling Mary “that was very kind to share your toys” is great (she’ll likely share her toys again), but telling her, “You’re such a kind person. Thanks for sharing your toys” will help shape her perception of who she is, rippling out to unique situations where she will have different opportunities to demonstrate how kind a person she is. 3. Reward behaviour you like. Rewards don’t have to be big. They don’t even have to be tangible. Some of the best rewards are things you can’t buy, like 15 minutes of Dad’s undivided attention playing whatever your child wants to play, a trip to the playground with Mum, or an extra story at bedtime. There is a difference between rewards and bribery. A reward is delivered for a job (or action) well done. It is usually delivered after the fact, but may be established beforehand. For example, “If you sit quietly and happily while we do the grocery shopping we will play in the play area after we’ve finished” or “Every time you do a wee in the toilet you can have a sticker”. A bribe is offered in an attempt to change behaviour when it is already happening. For example, “If you stop screaming we’ll buy the chocolate bar”. The difficulty with bribes is that while they are a “quick fix” they have the unfortunate side effect of sometimes teaching children to behave inappropriately until the bribe is offered. Rewards, however, encourage the repetition of a behaviour. Instead of accidentally rewarding inappropriate behaviour (which is what is happening in the bribery example), use rewards to your advantage by encouraging your children to live up to the positive expectations you have set. When a child has met their end of the deal, remember to let your child know why they are getting their special reward and refer specifically to the behaviour and character which you’re pleased with. This helps them know which behaviour to repeat in future. Remember that what one child finds rewarding may not have any draw power for another, so think through, observe and don’t forget to ask what rewards your child loves… while stickers may be the go for one child, another may want nothing more than Dad’s special “happy dance” that lets the child know how proud he is of his/her behaviour. A reward will help motivate behaviour only so far as the child values that reward. One reward we often underestimate is the verbal and emotional response we provide to our children’s behaviour. Often we tend to give our biggest reactions (think: words, volume, facial expression and body language) to their misbehaviour. Children who are seeking a reaction don’t usually care if that reaction is positive (“Wow! You’re such a great helper! Thanks!”) or negative (“STOP TALKING BACK TO ME OR I WILL GROUND YOU!”), as long as the reaction is big. So think about how you’re reacting and be careful to give the reward of attention + strong emotion to behaviours you’d like to see repeated and avoid inadvertently reinforcing unwanted behaviours. All in all when in comes to behaviour, the old saying “prevention is better than cure” applies. It is easier (and more rewarding) to encourage appropriate behaviour than it is to manage inappropriate behaviour. Set that bar high, letting your children know you expect and believe they can live up to those standards, praise the behaviour you like and be savvy in rewarding behaviour both through pre-planned incentives for specific behaviours and by reacting in a big, positive way to those behaviours that make you proud. Posted on March 13, 2016 March 13, 2016 by LynTagged behaviour management, expectations, parenting, praise, rewards.